Don't forget to steal a copy of Bonestorm from the Try-N-Save. 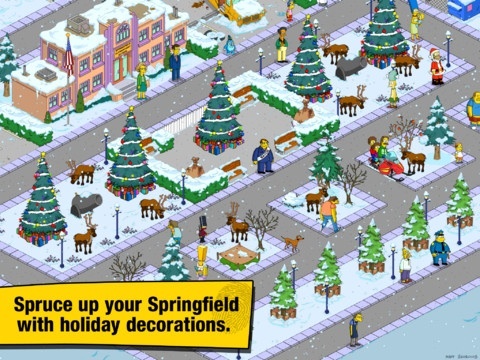 After teasing fans the past couple of days, Electronic Arts released the new holiday update for The Simpsons: Tapped Out. With it comes new characters, locations and of course, plenty of decorations. [I]-New Characters: Go on a binge with Barney, blast Sideshow Mel from a cannon, and have Santa Homer endure whiny kids' wishes. And it wouldn't be Christmas without Santa's Little Helper! -New Buildings: Steal a copy of Bonestorm from the Try-N-Save, roll a strike at the Bowl-a-rama, and feed the reindeer at Santa's Village. -Put Up Lights & Decorations: Decorate Springfield with a Holiday tree or light adornments for all the homes around town.